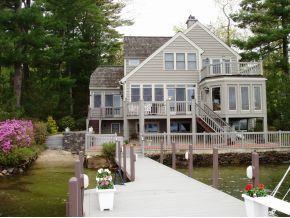 Luxury Wolfeboro Home with sandy beach and 4 bedrooms. 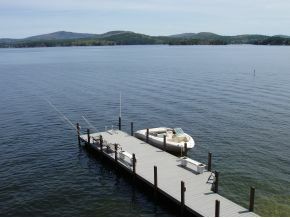 Lake Winnipesaukee with 42,000 acres is the jewel of New England. This spectacular custom built home by Wood & Clay, sits on the shore of Lake Winnipesaukee in Wolfeboro with unobstructed views of the lake and mountains. This luxury property has a 66'x10' permanent dock, walk-in sugar sand beach and is professionally landscaped with irrigation system. Wood Shake roof, multi-level decks, lots of glass and a 3-season sunroom. You have water views from every room, many amenities, recently painted inside & out. Located on prestigious Sewall Road and only a short drive by boat or car to your favorite restaurant in downtown Wolfeboro. Listed by WolfeboroBay Real Estate LLC. This contemporary home has 12 rooms with 4 bedrooms and 4 bathrooms with over 3000 square feet of living space. The lower level is a walk out. Skiing at Gunstock is 30 minutes away, snowmobile to Meredith or Moultonborough or fish for salmon or trout right off your dock.